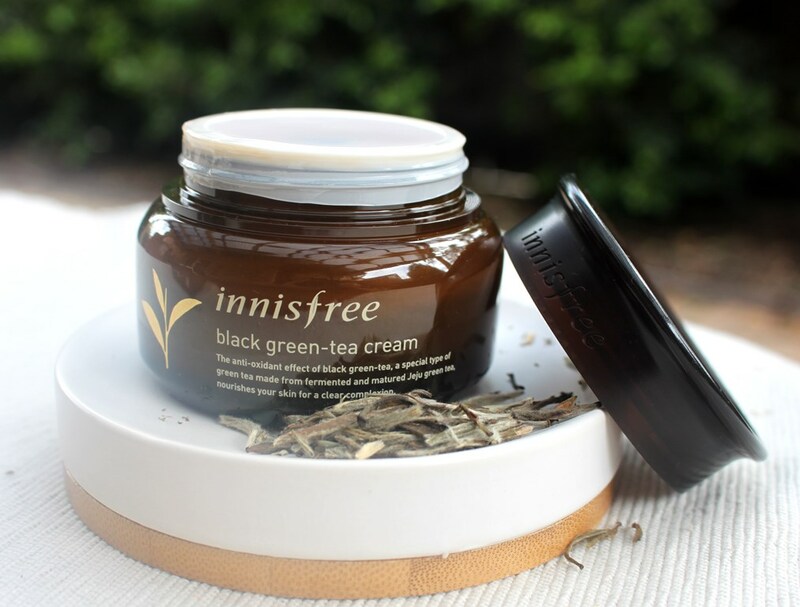 The Innisfree Black Green-Tea Cream is made from green tea, fermented to boost antioxidant power enabling deeper skin moisturisation and nourishment. Just like the mask that I previously reviewed from the same line, this cream also contains 55% pesticide and chemical free Jeju green tea that has been fermented and matured for 100 days in two stages for maximum skin benefit. Green Tea Extract is a potent antioxidant source that helps to protect skin from free radical damage, reduce inflammation, clear cell damage and repair wrinkles. When fermented, the effect is increased even further and the green tea takes on a blackened appearance, hence the product name. Rich in Catechins, a group of natural compounds called Polyphenols that protect against UV radiation and environmental stressors, green tea also helps to inhibit collagenase, the enzymes that break the peptide bonds in collagen, thus promoting skin firmness and elasticity. EGCG in particular, fights against sun damage and enhances collagen production for firm, supple skin. Also contributing strong antioxidant properties as well as anti-inflammatory effects are exotic extracts. Prickly Pear and Orchid Extracts get their strength primarily from flavonoid and polypenolic compounds. In addition to antioxidant properties, Japanese Camellia also contains Omega-6 fatty acids which help moisturise, assisting Squalane which is very effective at helping to hydrate, plump and soften skin without leaving any greasy residue. It also accelerates the speed with which cracked and chapped skin heals. Suitable for all skin types, it can help regulate excess oil production and enhance antioxidant activity. Due to its brightening ability, Citrus Unshiu Peel Extract helps to control melanin biosynthesis which in turn evens out skin tone and assists with the control of hyperpigmentation. A mild pH ranging between 5-8 defines Bacillus Ferment which relies on natural enzymes to clear dead skin cells to smooth the skin’s surface for younger looking skin. Acting as a soothing and skin-restoring agent, Adenosine has proven anti-wrinkle benefits due to its ability to energize skin’s surface, helping it to look smoother and younger. As it is naturally present in the body, it is a beneficial for all skin types. Humectants assure the skin is well moisturised and supple, well represented by Propanediol and Glycerin. Meanwhile emollients exhibit water binding properties for hydration including Caprylic/Capric Triglyceride, Shea Butter and Behenyl Alcohol which impart a soft and smooth feel to the skin. The Innisfree Black Green-Tea Cream is presented in a typical package for the brand, a plastic, opaque tub with screw top lid. When new, it includes a protective plastic film over the opening. The brown colour is representative of the brand’s black green-tea line. 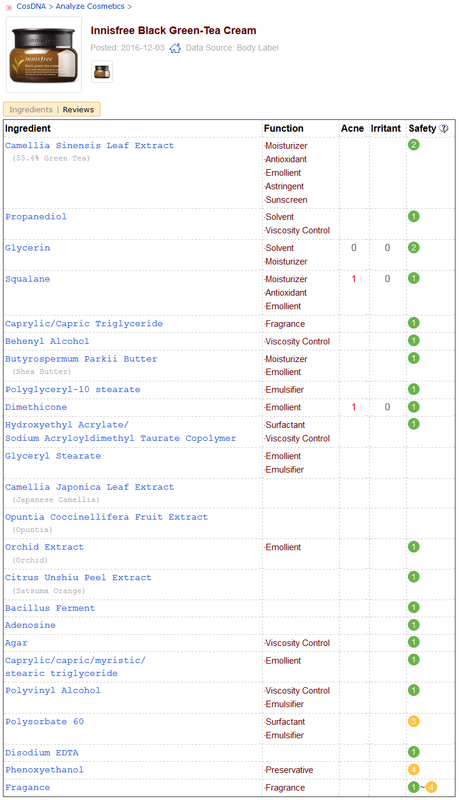 Other than fragrance and preservative agents, the assessment returned from both the CosDNA and EWG resources rate the Innisfree Black Green-Tea Cream favourably as a low to moderate hazard. Apply an appropriate amount over face and neck, then gently pat for better absorption. 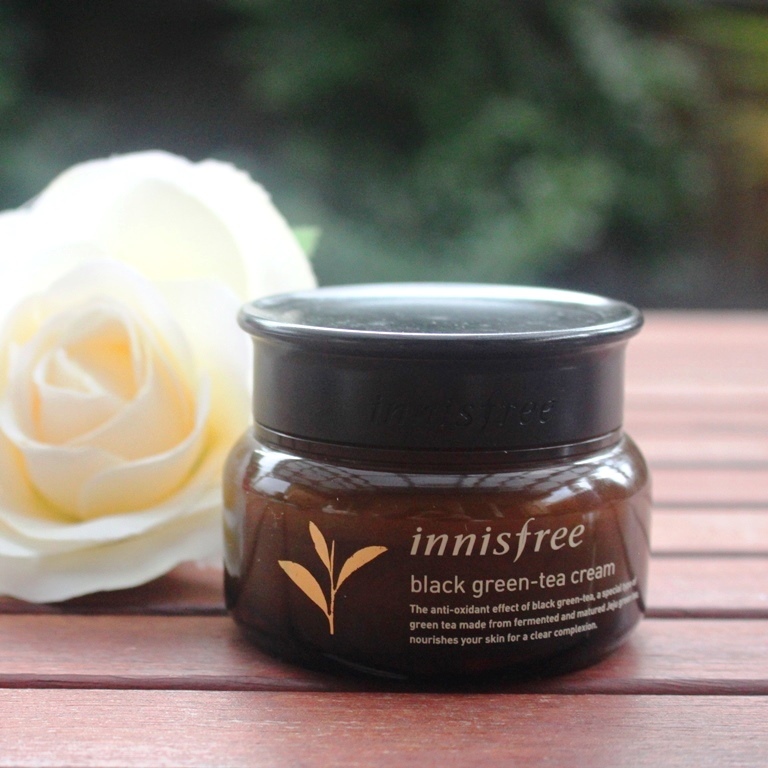 This Innisfree Black Green-Tea Cream has light synthetic fragrance. 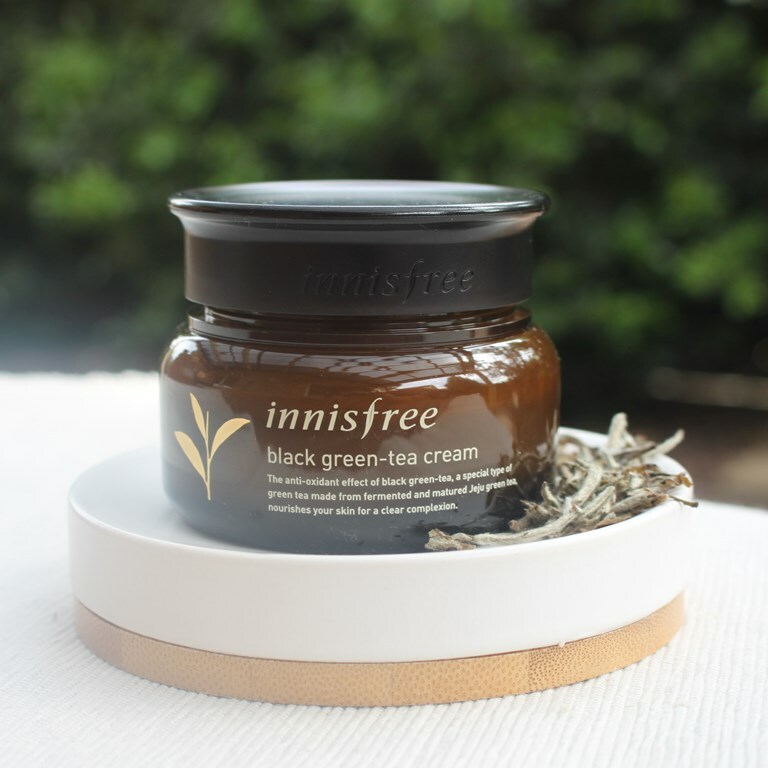 A 60ml tub of the Innisfree Black Green-Tea Cream sells for AUD$58 at the Innisfree website. 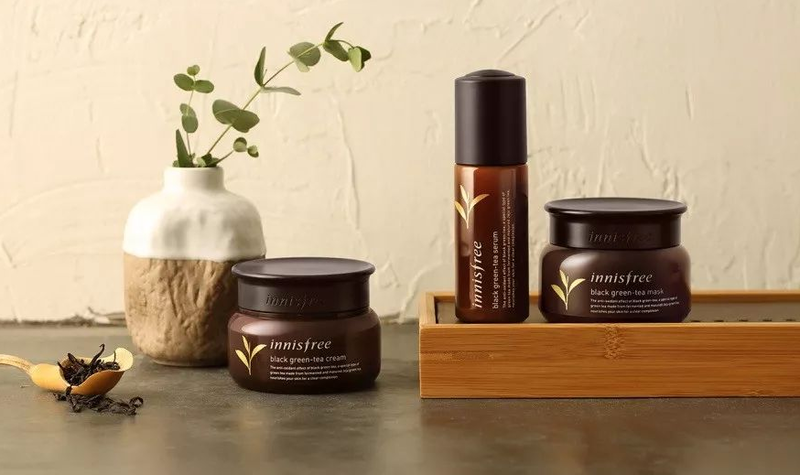 Innisfree products are available at Korean skincare boutiques including iHerb and Style Korean. The cream expires 12 months after opening with an estimated shelf life of three years. 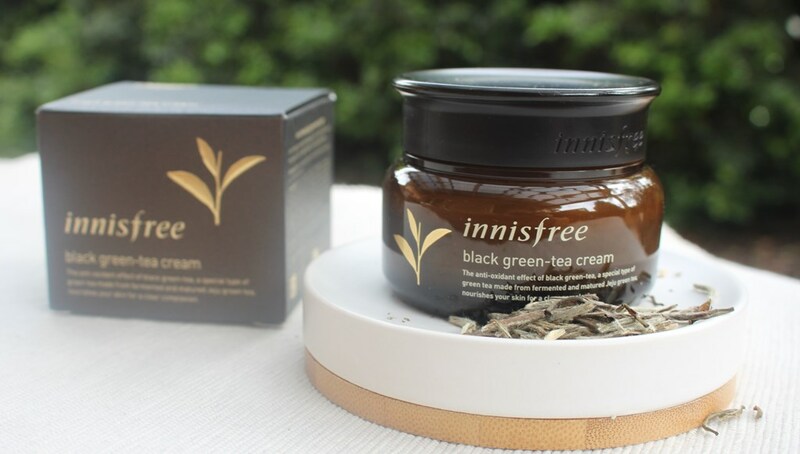 The Innisfree Black Green-Tea range is one of the more expensive from the brand. Tempted by the promise of anti-ageing delivered through potent antioxidants together with the excellent performance of the mask, I thought I would try the face cream… and it didn’t disappoint. The presentation is typical of the brand who have a specific colour dedicated to each range but consistent packaging across the board. There are sufficient preservatives in the formula to prevent product contamination that a wide opening and finger dispensing may invite. I prefer a pump action but this is typical of most creams and not a problem. The cream itself looks very luxurious. It is a delicate creamy and glossy tan colour with plenty of slip. It has a synthetic fragrance that smells like a perfume without resemblance to green tea. I don’t like the addition as it does not enhance the experience of this product, although the scent is not overly strong. Some may enjoy it however those with sensitivities to such additions may find it irritating. Personally, I had no adverse reaction but simply prefer my skincare fragrance free. I used this as the last step of my routine and saved it for the winter when additional moisturising comfort might be required. I found the previous cream I used from the brand, the Olive Real Power Cream too rich for my combination skin type and was warned that this one might be similarly received. Indeed it does have a very rich texture and would be overwhelming during the hotter weather unless your skin is dry. The slickness it has helps it to easily glide over the skin without any resistance. You can feel a thin film form which helps keep the moisture locked in. I found I had to apply it half an hour before bed to give it sufficient time to penetrate, otherwise, it would remain on the surface and adhere to the pillow. Due to this drying time, I only ever used this cream in the evening. I imagine trying to apply makeup over the top without sufficient delay could be messy. Provided these steps were followed, I found my skin would retain moisture and increase in suppleness and plumpness overnight, so it definitely moisturised well. The large amount (55%) of high quality, twice fermented green tea would also suggest extremely good antioxidant protection. I find it very difficult to declare observed improvements in the rate of skin ageing over a short period of time. This cream lasted me around three months with nightly use. Furthermore, how can you conclude a slowing of ageing without proper clinical conditions if you can’t compare your skin after using this product for three months with what it would have looked like at this time without the cream? Nonetheless, given the formulation, I would anticipate excellent antioxidant protection. Another solid product from a great brand that I have grown to enjoy and trust. An impressive ingredient list and good performance have earned this cream my tick of approval. I would strongly recommend it for those suffering skin dryness but would warn against using such a rich moisturiser if you deal with an oily complexion. Hi is it for every evening use? Or twice a week? And should I apply first the ampoule and apply the cream after? Hi and thanks for your interest. 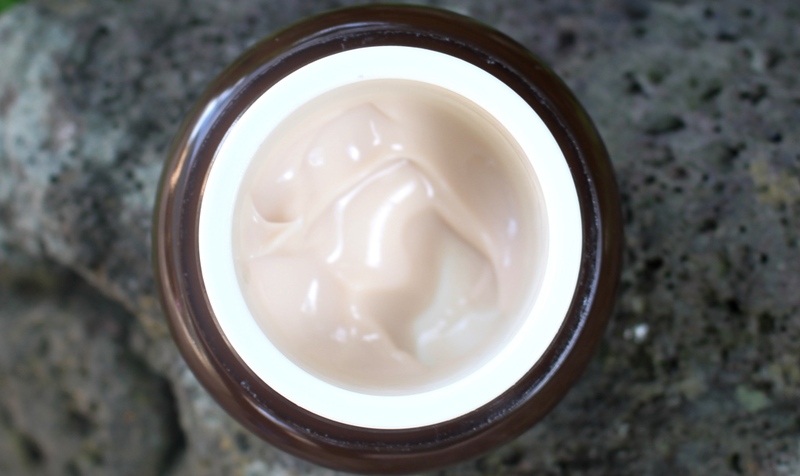 Although this is a rich cream, it can certainly be used every day, it simply suits drier skin types. And yes, serums and ampoules should be applied before cream.